Agent Lanae Barnes shows off this gorgeous condo located at Two City Plaza – West Palm Beach Condos. 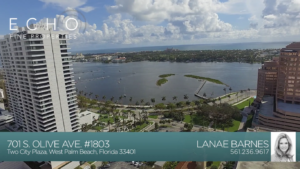 This two bedroom + den property has stunning views of the Intracoastal & ocean…not to mention an incredible rooftop pool…Check out the video and share with your friends or family who are looking for the perfect view of paradise! Or check out the listing on Facebook. Posted in real estate, Two City Plaza, Two City Plaza condos, Two City Plaza condos for sale, West Palm Beach, West Palm Beach condos, West Palm Beach condos for sale, West Palm Beach homes, West Palm Beach homes for sale, West Palm Beach real estate, WPB condos, WPB condos for sale on September 28, 2017 at 7:17 am.